Need a quick formative assessment tool for material? Create an interactive quiz for your students with more points for faster answers. This does not allow you to download answers or view specific students' records, so it isn't helpful if trying to assign a grade. However if your students have a mobile device/access to the internet in class, a Kahoot can help you check on retention of material at the end of a lesson. You need to make the Kahoot before class as it takes a few minutes to make. Go to GetKahoot.com and follow the instructions to create or find a quiz, discussion question, or survey. 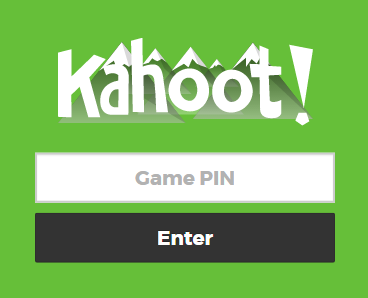 Once it's finished and you can our students will go to Kahoot.it to enter the game's PIN (see right) and enter a nickname. Lets you send individualized feedback to each student." Both the iClicker and SMART Response systems do basically the same thing, allowing teachers to instantly poll their students and assess their grasp on a concept. They allow you to connect with every student and essentially force them to participate as you protect their anonymity: students are significantly less afraid to make a mistake. The SMART Response remote has several different iterations. Both systems do have an app for smart phone compatibility, and both have solutions for grades K through 12 and beyond, including in higher education and in workplaces. Whether it's designing an online newspaper site or presenting a research topic, Weebly for Education gives students the opportunity and ability to easily create good-looking, functional websites with things like maps, photo galleries and slideshows, embedded YouTube videos, surveys, blogs, forums, and anything else you can embed with HTML or Flash coding. For example, check out this "international news station" covering the Cold War from the 21st century for a project in IB European History.